Clematis care is easy when you take to time to select the best species for your comfort level and environment. With the right knowledge, many clematis species are easy to grow and care for. You’ll be pleasantly surprised at how simple it is to ensure your clematis plants grow and prosper. Clematis is a genus of evergreen or deciduous climbing vines or herbaceous perennials that are grown for their beautiful colorful flowers. This genus consists of approximately 300 species and a variety of large-flowered hybrids. Leaves consist of three to five leaflets. A Clematis flower has four to eight petal-like sepals in a variety of colors and sizes. There are three basic flower forms: small white flowers in loose, branching clusters, bell-shaped flowers, and flat or open flowers. For a continuous show of flowers from late spring through autumn, plant a combination of early, midseason, and late bloomers. While most clematis varieties are best planted in the garden near some type of support, such as a trellis, pergola, fence, or wall, some species can be used as ground cover or planted in a container. Full sun – Clematis vines will benefit from a minimum of 6 hours of daily sunshine. 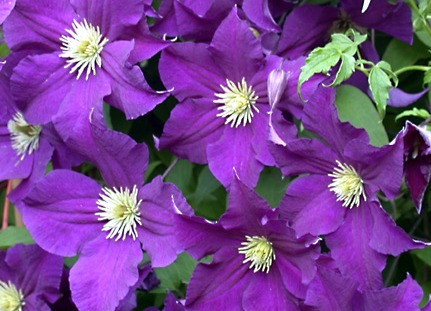 Keep soil evenly moist - water clematis vines once or twice weekly. 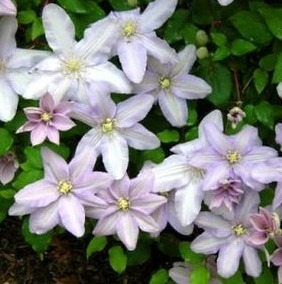 While Clematis flower vines need evenly moist soil, do not overwater. Fertilize when the vine starts showing new growth in the spring. Fertilize a second time in early summer after the round of blooming is complete. Add a layer of compost and mulch when the soil warms up in the spring. Apply the mulch eight to twelve inches away from the base of the plant to minimize chances of rotting and rodent infestation. The mulch will also help to keep the roots cool during hot summer months. The nutrients and organic matter in the compost will leach into the soil over the summer months. Pruning requirements will depend on the type of clematis you have. Early-flowering clematis varieties that produce flowers on the previous year's growth should be pruned within a month after they are done blooming. You can also remove damaged or dead wood, or trim overgrown shoots to keep it confined to the allotted space. Large-flowered cultivars that bloom on both previous year’s growth as well as new growth should be pruned before new growth appears around mid-February or early March. They can also be pruned in the fall. Remove damaged or dead wood and lightly trim the portions of the vine that bloomed. Late blooming clematis varieties (summer and fall) flower on the current season’s growth. Prune rigorously down to within one foot to eighteen inches above the soil level (before new growth begins). They can also be pruned in the fall (to about three feet), with a follow-up in the spring. A rich organic soil amended with compost. Clematis vines can be planted in hanging baskets or pots. If planted in a traditional pot, provide some type of support, such as a small trellis. Support is necessary when planted in the landscape as well; plant near a trellis, wall, pergola, or fence. Dig a hole approximately 18 inches deep and wide, setting aside the soil. Add two shovels of manure or compost to the hole. Mix several shovels full of manure or compost into the soil that you removed from the hole. Add part of the mixture to the hole - cover the manure at the bottom of the hole. Tamp down lightly. Moisten the roots of the clematis by immersing the container in a bucket of water for ten minutes. Place the vine into the hole so that the root ball is two inches below soil level. Fill the planting hole with the remaining soil mixture, firming it into place with your hands. If the soil is slightly high, it will eventually settle. Tie stems to a support to direct new growth toward a trellis or other structure that will support the mature vine. Water the soil thoroughly after planting the vine. Mulch with two to three inches of material such as pine bark mixed with a little manure. This will help to retain moisture and keep roots cool.